1. 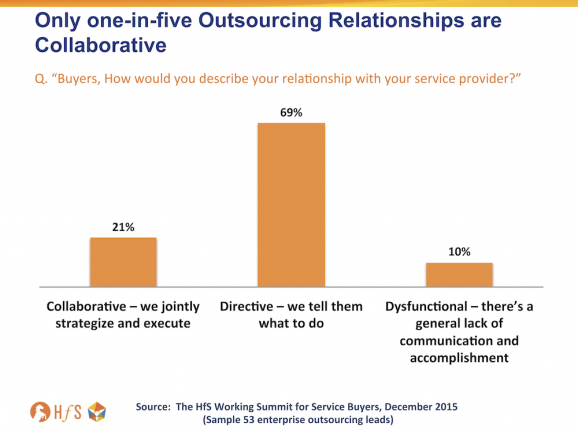 Outsourcing is now part of a broader management capability; it is not a standalone profession. Outsourcing is a competency that is learned on the job and through real experience as opposed to a qualification or certification. It is an ongoing, amorphous capability that has no end-state or stamp of perfection, it is the ability to partner to improve constantly processes, outcomes and performance. Outsourcing is a means to improvement, access to resources and better capability, usually not the means to a specific end. 2. Intelligent Automation has emerged as a core competency for operations staff. 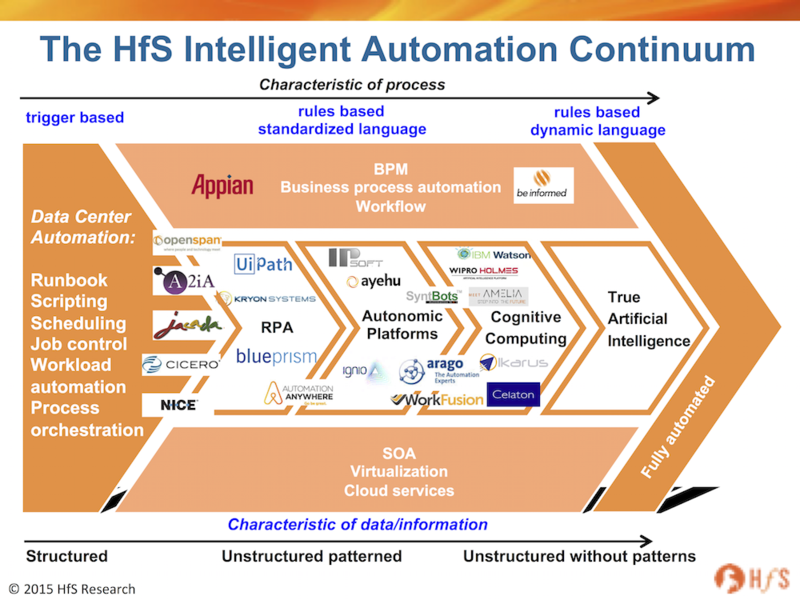 Like outsourcing,Robotic Process Automation (RPA) is a means to improve processes and applications, but rarely the ideal end-state - it typically is retrofitted to make legacy applications and processes function more automatically and efficiently. Legacy operations delivery and BPO can only achieve a certain level of efficiency, without a well-planned Intelligent Automation roadmap. RPA is one of the leading technologies to provide efficiency improvement in rules based tasks and processes, but Intelligent Automation (see link) is also now including the adoption of real time self-learning techniques, predictive analytics and cognitive computing. 3. Ambitious providers will cannibalize their revenues when their buyers give them more to work with. Moving forward, buyers will need to make some new investments in Intelligent Automation (especially RPA) technology and expertise, while the service providers will ultimately have to concede they may need to reduce the FTE provision on their side, as automation takes effect. A service provider must prove it can redeploy "freed-up FTEs" on their clients’ higher value processes. So these two motivations should go hand-in-hand: decreasing labor effort on automatable tasks and increasing it on the higher value work the clients would like to outsource in the future. 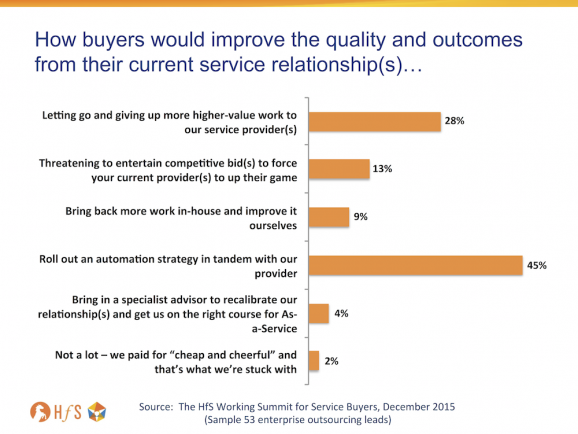 So, if buyers and their providers can get this right, automation will be a long term play for both parties, where higher value work gets done and delivery staff are kept busy because of the closer collaborative relationship and greater volume of work being parsed out. 4. The race to the bottom is killing innovation. This is tied in part to Insight #3, large outsourcing deals have been driven by desire to drive out costs continuously and make the processes increasingly more efficient. This constant race to the bottom is not sustainable and is impacting service provider’s ability to add value to deals in a tangible way. Although, service providers need to take notice of Insight #3 and work with buyers on automation to help plug this innovation spending gap. Effective Design Thinking can work, provided both buyer and provider can use the method to agree, prioritize and ultimately execute on common outcomes that constitute success for both parties. One buyer said we must learn to “think big, start small, and adapt fast”, which is the heart of the design thinking ethos. With many making the point that design thinking is not about turning all your staff into product designers, it’s a technique to empower staff to become change agents. Used in conjunction with rapid development techniques like DevOps, it allows staff to make changes with a great deal less investment and resultant risk. 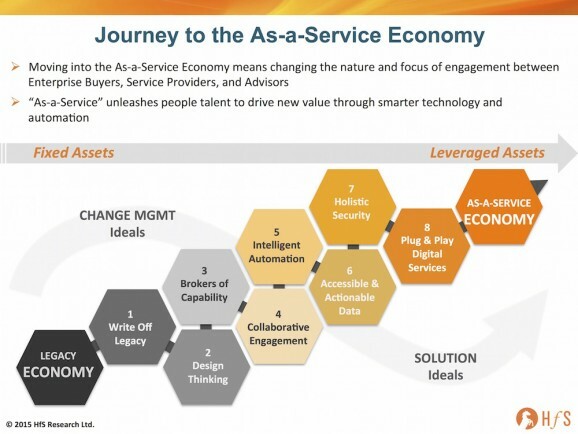 One buyer at Harvard put it like this “empowering process owners and overcoming fears of accountability is a crucial step moving toward the as a service economy.” Although there was a note of caution, the edge given by design thinking may be short lived as its second nature to Millennials, they don’t need design thinking, they just call this thinking! We are in a world of constant change and fast moving developments. To capture the value, we need to have effective ecosystems brokered by Global Process Owners. These people can define business problems, identify opportunities and broker relationships to bring the best solutions together across internal and external resources. These skills are developed through experience, not by training, and challenges HR to rethink its approach to hiring. Creating a more “fluid workforce” by shifting selection from an inventory of skills to a candidates "coach-ability.” HR needs to be more effective in defining and building these ecosystems in order to effectively recruit and manage the people who will make it happen. The generations entering the workforce and growing up in it today, may not have a career “path” so much as a career “journey”—a general direction that is taken in steps that follow their interests and capabilities matched to opportunities. 7. The strategy behind the deployment of Digital Plug & Play Services remains bifurcated. Enterprises are rapidly increasing their investments in digital platform based services that deliver processes around a system of engagement (e.g. CRM, Marketing, HCM, Procurement) but remain as reluctant as ever to take on re-platforming core systems of record (e.g. Finance, Accounting and Claims Systems). As a result, Intelligent Automation will be focused around systems of record, to prolong the life and extract greater value for enterprises out of these legacy platforms for the next several years. 8. Automation is impacting entry-level roles—and the industry is not prepared. The roles that used to drive entry into business process and IT careers (e.g. data entry, level 1 help desk, systems admin, exception processing) are changing as many of the core tasks for these roles are being addressed by deployments of Intelligent Automation. As an industry, there is a need to recognize this change and determine what will constitute new entry-level roles and career paths for the future. This means changing many elements including: educational programs, models for recruiting and training new employees, promotion and evaluation criteria, supervisory role definitions and more. It also means that middle management baby boomers and Gen Xer's will have to accept that their reports will build their careers on criteria that are new and sometimes hard for the older employees to recognize and accept. 9. Organizational design will become a key differentiator. Workforce demographics, rapidly changing employment contracts, business process automation, and cognitive computing will collectively stretch traditional employment and organizational models to the breaking point. Enterprises that are able creatively to leverage these disruptions will not merely succeed, but will replace once-respected slow-to-move competitors. When we look back at 2015, I think we'll reflect on a year of confusion and too much over-thinking of what's happening down the road. What we learned at Harvard is that many enterprise buyers are much more aware of what is possible, but struggle to engage effectively with their provider to risk more and share more to find new thresholds of value. However, there is a strong realization that if you fail to tie your career to Intelligent Automation, understanding how to leverage digital technology more effectively, noone's going to wait for you to catch up. None of this stuff is rocket science, it's simply resetting the goals and revisiting stagnant relationships to figure out a realistic way forward. Sadly, I do think money and cost is the ultimate arbiter of change, and it's not until the providers really start to feel the squeeze on their profit margins, and the clients get tempted by disruptive rebids, will we really see much of the change described above become reality. Those service providers and buyers which have not yet begun to address (with genuine investment) the reorientation of capabilities and enablement of technologies to support business model disruption, are already circling the drain of yesterday's legacy.